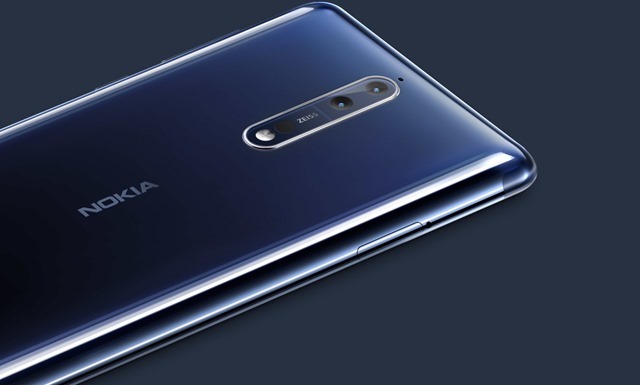 The Nokia 8 flagship phone made by HMD Global has been announced today, and it offers some serious competition to this year’s big names. The Nokia 8 sports a 5.3-inch 2K QHD IPS polarized display, which is protected by 2.5D Corning Gorilla Glass 5, while the metal body is made of aluminium. The company says that it has included a full-length copper cooling pipe with graphite shield to dissipate system heat across the entire body of the phone. The device runs on stock Android 7.1.1 Nougat with Google Assistant and other Google apps pre-loaded. The Nokia 8 is powered by a Qualcomm Snapdragon 835 processor clocked at 2.5GHz, with 4GB LPDDR4X of RAM, and 64GB of internal storage. There is a microSD card slot which supports up to 256GB of expandable memory, which is part of the Dual Hybrid SIM slot. 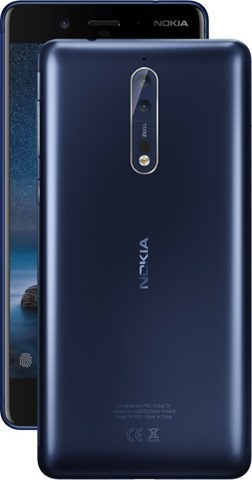 The Nokia 8 features dual 13 megapixel rear cameras from ZEISS optics, one of which is a monochrome sensor, while the other is an RGB Colour sensor which supports OIS (Oproical Image Stabilization), 4K video recording, and Audio Focus to reduce background noise. The cameras have a 1.12um pixel size, 76.9° angle, an f/2.0 aperture, IR range finder, dual tone LED Flash and supports PDAF (Phase Detect Auto Focus). The front camera on the phone is a 13 megapixel selfie snapper with an f/2.0 aperture, 1.12um pixel size, 78.4° angle lens, and supports display flash. The device has a dual-sight mode, which allows you to use the front and back cameras simultaneously for split-screen videos and photos. The Nokia 8 has a USB Type C port, which uses the USB 3.1 Gen 1 standard, capable of 5Gbps file transfers. Don't worry, there is a 3.5 mm headphone jack, and the phone uses Nokia OZO for spatial 360° audio. The device is packed by a 3090mAh non-removable battery. Connectivity wise, the Nokia 8 supports Wi-Fi 802.11 a/b/g/n/ (MIMO), Bluetooth 5.0, 4G LTE Cat 9 (450 Mbps downloads/50Mbps uploads), 3Carrier Aggregation, GPS/AGPS/GLONASS + BDS, NFC, ANT+. The Nokia 8 has a fingerprint scanner on the front panel. Other sensors on the device includes an Ambient light sensor, Proximity sensor, Accelerometer, E-compass, Gyroscope, Hall sensor and Barometer. The Nokia 8 is IP 564 certified to be Splash proof. 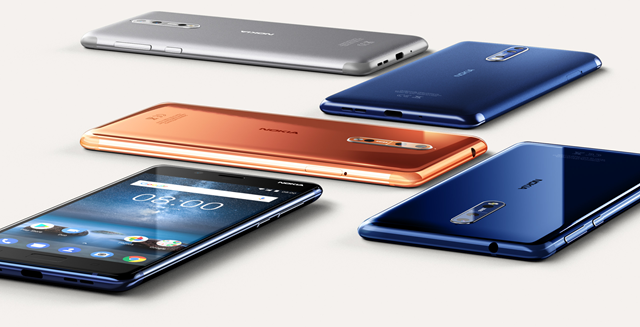 The Nokia 8 will be available in Polished Blue, Tempered Blue, Steel, Polished Copper colours. The Nokia 8 has been priced at 599 Euros (around Rs. 45,000) and will be available globally in September, and will be launched in India in October (not confirmed). Nokia 8 officially announced. and here are the technical specifications of the device.